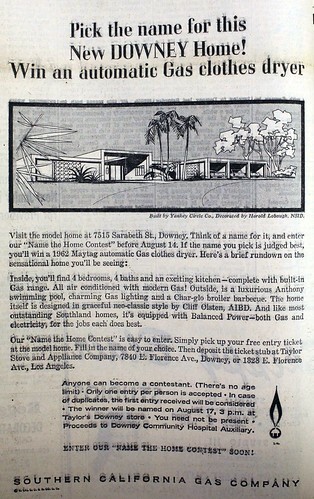 If you picked the winning name for this Downey home back in 1962, you could win an automatic gas clothes dryer. This home must have been a Southern California Gas Company showcase. It offers gas air conditioning, a built-in gas range, and gas lighting outside. However, even the gas company has to give a nod to electricity: "... it's equipped with Balanced power—both Gas and electricity, for the jobs each does best." I love that house! Super landscaping. The old notice is pure gold, too. Thanks for sharing it.